This tea canister is printed with the later version of the Fence pattern that appears to derive from the Worcester version. The fence has detailed panels in contrast to the version on the saucer. 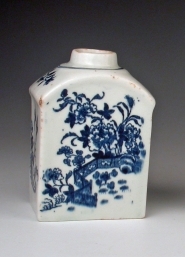 The shape of the canister is characteristic of Lowestoft and this piece dates to c1775-85. This Lowestoft saucer bears what seems to be the earlier of two versions of the Fence pattern that were used at the factory. This earlier print shows a fence of very open character. The two line border is painted.